After 10 years of research and development, United Parcel Service is officially launching an automated system that uses algorithms to devise optimal routes for its drivers, reports The Wall Street Journal (Oct. 31, 2013). It says the new tool will slash fuel consumption and costs, and support the creation of new services. UPS’ CIO said that the company believes that its on-road integrated optimization and navigation program—dubbed Orion—is the world’s largest operations research project. Ten thousand of its 55,000 drivers will be on the Orion system this year, and it will be fully deployed by 2017. The effort involved a team of 500 workers. The computer scientists in the group have written an algorithm with 1,000 pages of code. 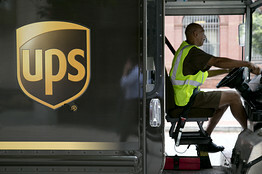 It’s the largest technology project at UPS, which invests $1 billion a year in technology. First, the company had to install GPS sensors to track its drivers and vehicles, a technology known as telematics. That effort already has avoided about 100 million minutes of engine idling. UPS then devised its own mapping system, which includes about 250 million delivery points, a database that is updated continually. The company’s operations research group devised algorithms that calculate the best route for each driver on a given day. In 2008, those calculations could take hours to perform. Now, they are done in 8 seconds. The payoff on the investment will be measured in a variety of ways. The company stands to save $50 million a year if every driver can simply reduce the length of his or her route by one mile a day. That will help UPS reduce fuel consumption and environmental impact, while allowing drivers to make more deliveries per day. This year, technology will help the company save 1.5 million gallons of fuel and reduce CO2 emissions by 14,000 metric cubic tons. This entry was posted in Domestic Business. Bookmark the permalink. ← Is Your Company Tracking Employees With GPS?